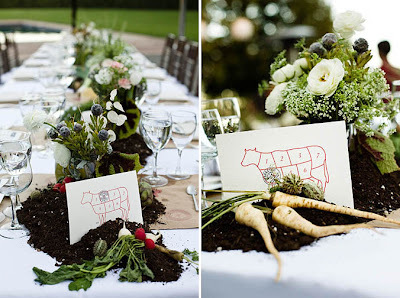 I also effing love these dirt centerpieces from today's Snippet & Ink wedding. *Meg, please try not to gloat. Knew you'd love it. I kind of want dirt centerpieces now. 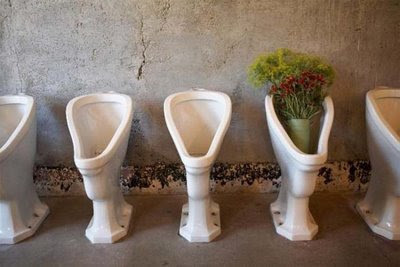 Sadly, the Headlands Center for the Arts has changed their policy and no longer allows flower displays or any other decorations in the non-working urinals :( That pic is destined to be unique. On the other hand, the restroom is still unisex, which should allow for plenty of hilarity! 1. thanks for the urinal picture. 2. thanks for the dirt picture now i have to change my venue and everything else around because i want dirt. ha ha ha! love this.